It seems that there are multiple different mental states that people have historically called "enlightenment", as well as many different types of contemplative practices with different underlying cognitive mechanisms. I link to and quote from a couple of papers showing this. Given the apparent multiplicity of "enlightenment" states and contemplative practices, I'd like to request that future discussions on these topics include more detailed references or descriptions as to which states and practices are being talking about. Can enlightenment be traced to specific neural correlates, cognition, or behavior? Given the differences between various competing conceptions of awakening, one scientific approach to tracing enlightenment would be to use the tools of social psychology to investigate which states and traits are valued in a particular community. For instance, recent work in moral psychology suggests how value judgments of people and practices as either enlightened or unenlightened could be traced to affective reactions of admiration and disgust (Rozin et al., 1999; Schnall et al., 2008; Brandt and Reyna, 2011; Schnall and Roper, 2011). Some of the most virulent disagreements over what counts as genuine awakening occur between closely related practice traditions, such as the debates between various Theravāda Buddhist traditions in Burma over which states are to count as realizations of nibbāna and which are instead to be counted (merely) as states of deep concentration. Surveying these debates, Sharf (1995) concludes “there is no public consensus as to the application of terms that supposedly refer to discreet experiential states within the vipassanā movement” (Sharf, 1995, p. 265). 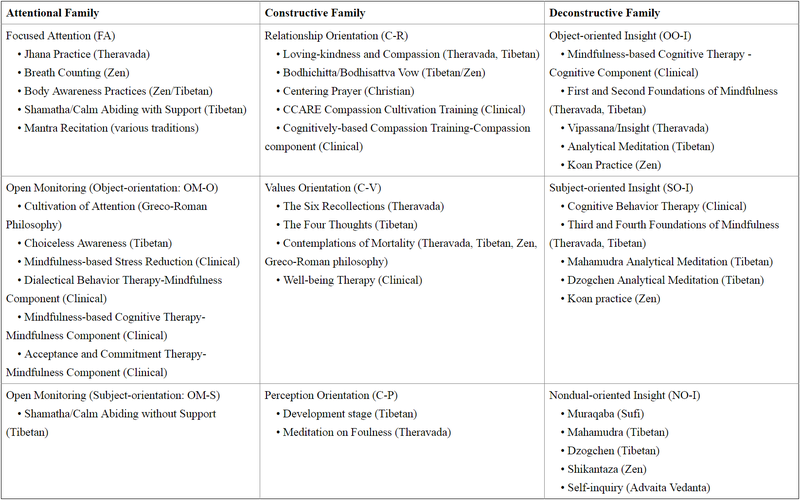 In this article we expand our original framework to accommodate a broader range of traditional and contemporary meditation practices, grouping them into attentional, constructive, and deconstructive families. According to this model, the primary cognitive mechanisms in these three families are (1) attention regulation and meta-awareness, (2) perspective taking and reappraisal, and (3) self-inquiry, respectively. To illustrate the role of these processes in different forms of meditation, we discuss how experiential fusion, maladaptive self-schema, and cognitive reification are differentially targeted by these processes in the context of Buddhist meditation, integrating the perspectives of other contemplative, philosophical, and clinical perspectives when relevant. Now this is really interesting; I wasn't aware this level of teasing out individual threads had been attempted yet. Am I correct in reading this table that Tibetan is the only tradition which has a technique in every category? Does Tibetan have a privileged place in the study at all (for example an expert on the tradition participated in its design)? I am particularly curious why Calm Abiding Without Support proved to merit a category all to itself; this paper is going in the reading list. I'm actually somewhat suspicious of the overall quality of the table given how it classifies shikantaza. Shikantaza can lead to non-dual insight but is in practice more like open monitoring, though through shikantaza you can have insight of no-self and the non-dual nature of reality, but this is also possible with koan practice. They may explain more in the paper how they came up with this classification but just reading the table I'm uncertain how much info you can draw from it though to be fair much of it is right and this may turn out to just be an error or a nit.